Some bullion coins are already currency. They do not circulate because the designated monetary value is way below the market value and so they are hoarded. Imagine what would happen if the government decided to use silver coin for money and implemented a policy such as this. Silver coins as money will be allowed to circulate alongside EURO/Irish fiat bank notes. A one ounce silver coin will be issued a monetary value according to its silver content. The one ounce silver coin .9999 pure contains one troy ounce of silver and will be issued a monetary value guaranteed to be 20% higher than the world spot price at the Friday close each week. While this monetary value will rise according to the world market spot price for a troy ounce of silver it will NEVER fall. This adjustment in the price will be done on the Sat night/Sunday AM time slot. For example, this is the mechanism for the calculations. Today Sat 4th Dec 2011 we imagine as the date of implementation. The Spot price of silver is in Euros E24.27. Plus a markup of 20% or E4.85 = E29.12. There is one other calculation required. To make a simpler calculation to avoid irritating small adjustments we need a number divisible by 5. The E29.12 is then rounded up to the nearest multiple of 5 which is E30. All one ounce Silver coins will now circulate for monetary purposes at the designated monetary value regardless of the printed amount on the coin. Should the spot price of silver rise to a price higher than 80% of the monetary value, such monetary value will be adjusted the following weekend by a multiple of 5 until again the monetary value exceeds the spot by 20%. Say the spot price rises to 24.50. Plus it by 20% = 29.40. Raise it to the nearest multiple of 5 = 30, so there is no change in the monetary value as suggested in the calculation above. If the spot price increases to 25.50 we calculate the new monetary value as follows. Plus the spot price by 20% = 30.60. Rounded up to the nearest multiple of 5 = 35.00 as monetary value, for an increase of E5. If there is a slump in the price of silver and it drops in the spot price to E20.00. Plus by 20% = E24.00. That is a lower price than the high of E35.00 so the monetary value is unchanged and remains at E35.00. Why do we have this policy of the mark up to at least 20%? In order for silver bullion coins to remain in circulation and to not be melted down to bullion it is essential that the monetary value be always higher than the bullion melt price or the spot price. There are costs associated with obtaining silver. It is possible that governments or government mints can obtain silver at spot price but the price could be higher. Any overage is sovereignty to the government that allows the government to accumulate bullion as a reserve. As these reserves accumulate it adds strength to the value of all Irish currency and the Irish economy. FRACTIONAL RESERVE BANKING OF ANY KIND RELATING TO SILVER OR THE NOTES WOULD BE OUTLAWED. All people in the world would be confident that the monetary value of a silver coin would never drop. Whereas, silver bullion would fluctuate in value depending on the world spot price, as happens at present. For Irish citizens the preferred method of saving would be in silver coins which could only go up in monetary value and not down. Banks would be able to store, in vaults, any amount of silver coin on behalf of customers. Such “deposits” would be custody accounts secured by the bank but would not be the property of the bank. (Currently, cash deposits, that pay interest, become the property of the bank and the bank is able to lend that money with no permission from the depositor.) It is foreseen that the bank would/could offer services to the depositor for which they could charge. An electronic bank account could allow a depositor to use the “Money” in the bank to pay for goods and services by debit card as is currently done. As the trade flows back and forth an accounting is kept and the settlement made in specie according to the records. The depositor could claim back from the vault up to as much coin as his account now says he owns. Banks could, of course, buy their own coins to be held on their own account, which they could make available for sale to the public. The silver coin deposited in a bank or owned by the bank cannot be loaned out in any proportion (no fractional reserve banking) and at all times the amount outstanding to the customer is 100% backed by the coin on deposit. If the customer opts to accept fiat bank notes from the bank to replace the silver the customer no longer owns the bullion which it has effectively sold to the bank. It is suggested that the Government of Ireland form its own commercial bank to facilitate the distribution of Silver coins in the widest dissemination. It is further suggested that the Irish Postal Service, An Post, be utilized for this purpose. It is already in place in every town and has a courier service component operating. At a time when the world spot price of silver drops any appreciable amount it is also the time that the seigniorage to the government is greatly increased and so it is an opportunity for the government to buy bullion to issue in to coin at the much higher monetary value or at a later date at a still higher value. However, at no time can anyone demand the mint buy bullion from them. The mint will be instructed to coin silver money to meet demand but it will be the prerogative of the bank to decide when and where the bullion is obtained and how much is paid. The Irish mint will provide the same guaranty of weight and quality of the coins as at present .There will be no taxes on monetary coin. It is recognized that a .9999 pure silver coin is not the most durable as its softness causes wear and tear. It is further recognized that sterling coin of 92.5% pure with the balance alloyed with copper provides a much harder more durable coin. It is proposed that at a future time consideration be given to production of sterling silver coins but still containing the full one ounce of silver as has the current one ounce silver coin. As we expect the silver coin to be used initially as a vehicle of savings it is not expected that the one ounce silver coin will go into immediate circulation to any large degree. At some point the coins will start to be useful for circulation and trade and that would be the time for the Irish Mint to provide sterling silver coins in any amount until the demand is sated. There is recognition that the Irish mint production will not be able to obtain silver in sufficient amounts in the initial introduction. Therefore it is suggested that any silver one ounce coin issued from a reputable mint with the required guarantee of quality and weight will likewise be monetised. For instance the Canadian One ounce silver Maple Leaf and the US silver eagle could also be monetised as described above. “In order to palliate the financial crisis and the economic recession, central banks and governments have reacted by injecting more liquidity and credit; these actions have intensified the causes that provoked the instability, further weakened the whole system, caused a world crisis of deficits and sovereign debt and further increased penury and scarcity in the majority of the population. These “rescues” and emergency repairs have succeeded in prolonging for some additional months the life of the financial system, but they will cause its collapse to be much more dramatic and painful. The International Monetary Fund has itself warned that “the risk of a double recession has increased” (IMF Report, June 1, 2010). The ultimate origin of the financial and economic problems of today dates to August 1971 when real money – backed by precious metal – was substituted by fictitious money, which can be issued exorbitantly because it consists of nothing other than paper and computer digits. “The restoration of the silver currency of Ireland by the very simple procedure outlined here can provide the life-saving alternative. There is, at present, no practical proposal for a viable action in the field of money. Perhaps there can be no other practical proposal? Perhaps a return to silver money is the only path out of the present crisis of civilization? The primary function of a central bank is supposedly to monitor and control a nation’s money supply by either printing money, removing money or raising and lowering interest rates. The modern central bank prints paper money divorced from an underlying asset, which means that the bank can print as much as it chooses. The first central bank was the Bank of Amsterdam, established in 1609. Almost 100 years later, the Bank of England was created by Scottish businessman William Paterson in the City of London at the request of the English government to help pay for war. In the US, the Federal Reserve was established in 1913. By 1935, the only significant independent nation without a central bank was Brazil, which today has one. Central banks are thus prevalent around the world, including Asia and China. China has a central bank, though unlike some central banks, the People’s Bank of China is not considered independent of the State but is run by the Chinese Communist Party. Whatever central banking was once, the idea is basically flawed. Human beings do not know how much money an economy needs. Only the free market can determine that. Nonetheless, a host of socialist and quasi-socialist economists have glorified the role of central banks and obscured the real reason for their invention. Perhaps the most brilliant of these central bank apologists is John Maynard Keynes, himself a central banker, whose great economic tract, The General Theory of Employment, Interest and Money, advocated the use of both fiscal and monetary stimuli to make economies prosper. With Keynes’s help, government intervention through taxes and central bank policies became an accepted way of running economies. In simplest terms, central banks inflate by creating money. The more money they create, the cheaper money becomes, and the less a government’s debt becomes. By cheapening money, the government deprives individual citizens of part of the value of that money. As the value is eroded, the citizen becomes poorer, even if he or she doesn’t notice it right away. There are three often-mentioned ways for central banks to help stimulate or deflate the economy. • One way is for the central bank to buy or sell Treasury IOUs. • Another way, which was more popular in the 18th and 19th centuries, is to raise and lower the rates of the so-called discount window, the amount that the central bank charges to its member banks for short-term borrowing. • The third way is to move short-term interest rates up or down. The main manner in which central banks move the economy is by adding to or subtracting from the amount of money in circulation by buying or selling government bonds, as mentioned above. Even raising short-term rates constitutes a kind of tax because when rates are raised, bonds can lose their value, and citizens holding onto bonds — especially longer bonds — can suddenly find themselves poorer by thousands of dollars as the market reacts to rate news. While the manipulations of the central banking mechanism sound innocent enough, free-market economists fervently blame almost every economic disaster of the last 500 years, with the exception of Tulipomania, on government intervention in the money supply or the marketplace. Today, thanks to the Internet, central banks are under attack as never before. Their franchise provides the great central banking families with the funding they need to try to move the world toward global governance. Nothing in the world is what it seems today because of central banking and the monetary distortions that it causes. The boom-bust cyclicality of modern economies can be laid directly at the feet of central banking, with its monetary stimulation, which first expands an economy and then contracts it when the expansion has gone too far. Thus, central banking is responsible for the manifold disasters that have overtaken the Western world in the past century at least. Wars, industrial collapse, recessions and depressions can all be laid at the feet of central banking and the great families that insist on its ongoing implementation. In the age of the Internet Reformation, however, more and more people understand how central banking really works and the devastation it causes. The 21st century may see a real conflict between a power elite that insists on a central banking model for the economy and millions, if not billions, who begin to demand free markets and freer economies. If You’re Not Buying Gold and Silver – Don’t Blame Me! Read it and weep all you “respectable” investment advisors and “financial journalists”; gold has finished its twelfth up year since the stock market top in January 2000, with silver finishing its tenth up year of the past twelve. To see the actual significance of gold and silver’s performance since December 1999, the table below lists the performance of gold and silver with the Dow Jones Total Market Groups (DJTMG) and some key economic statistics. And remember, for over a year the metals have seen a cyclical correction while the stock market has been “advancing”, as the “policy makers” stand guard against deflating financial assets. I use Currency-in-Circulation (CinC #41); the number of US Dollars printed and placed into circulation by the US Government as my inflation index. It’s not perfect, but far superior to the US Department of Labor’s Consumer’s Price Index (CPI #63). However, noting that the US National Debt (#22) is up 185.47% in the past twelve years, maybe I should begin using the increasing rate of flow for toxic waste emitted from the US Treasury as my inflation index. No matter, gold and silver sit comfortably at #2&3 in the table, far above the increases in CinC and the National Debt. This is important to all of us; seeing gold and silver appreciating faster than the frauds, wastes, and fiscal abuses of the Federal Government. Note that every item numerically above Digital Hardware (#72) has seen a negative return in nominal dollar terms since December 1999. However, anything above CinC (#41) up to Digital Hardware may have seen a positive twelve year nominal gain, but has performed below the rate of inflation as measured by CinC. Still, Washington will tax you for your nominal gains (inflationary losses) all the same. In truth, the financial media for the past thirteen years has had positive and negative things to say about every investment item listed in the table. Well they have. But on the whole, it is fair saying the financial media for over a decade has biased their reporting in support of the winning investments of the 1990s’, with most of them found between #73 & #100 with nominal double-digit percentage losses. Promoting precious metals when metal prices were near cyclical peaks, with the effect of luring uninformed investors to enter a market in danger of a normal short-term bull market correction. Speaking nothing but ill of the old monetary metals when they were correcting in price, suggesting that the precious metals bull market, the financial media has yet to acknowledge, was finally over. Just this week on Wednesday morning (Jan 02), Dennis Gartman on CNBC once again warned the public against considering gold as a “safe” investment. Then just hours later, Jim Cramer told his viewers to take a good position in the bank stocks as 2013 is looking up as a good year for the banks. If gold, silver and yes the mining shares too have done wonderfully since December 1999, most people investing in them have not done well due to intentional media disinformation. This is a real shame for aging Americans will discover in a few years that Washington has comingled their Social Security payroll “contributions” with the Federal government’s general-revenue funds. But one can’t simply look at dry percentages shown in the table above to fully comprehend the impact CNBC “experts” have had on its viewers’ net worth. So I based the table below on the performance of $10,000 invested in December 1999 to December 2012. Ten thousand dollars invested in gold, compared to the returns of the DJTMG’s Banking Index. Here is how I calculated the results; $10,000 could purchase 34.8068 ounces of gold in December 1999 (today $10K buys only 6.055 ounces), the banking index values are as published in Barron’s. 34.8068 Ounce of Gold @ $1,651.5 = $57,483.47 – DJTMG Banking Index performance (-$3,550.17) = $53,933.30 Difference in Return. A return difference of $53,933.30 between the appreciation of $10K of gold since 1999 and the depreciation suffered by investing $10K in bank stocks; that’s huge! You can be sure this will not be commented on by the financial media, but it’s true nonetheless. But we should recognize that things change; today’s heroes have a way of becoming tomorrow’s zeros. Gold and silver have been in a bull market for over a decade; how long can this last? In the years to come I expect gold and silver, and yes even the greatly despised gold and silver mining shares, will continue rising to price levels that are simply not believable today. Here is why. We all know that the Doctor Strangelove of perverse monetary science, Doctor Bernanke, will continue “injecting” the supply of US dollars in global circulation until our planet upchucks Obama bucks. And it’s not only the United States that is determined to make its unit of trade worthless; all other central banks are doing the same with their national units of account. Expect future demand for honest money (the old monetary metals), to be tremendous and global in scope. That alone should be sufficient reason reject Wall Street’s “investment recommendations” and buy as much gold and silver as one can afford. However, there are some interesting developments at the COMEX’s futures paper markets that suggest the smart play is to bias one’s portfolio into silver. Below we see the weight of gold held at COMEX storage facilities from 1974 to present. COMEX being a gold market needs gold on hand for delivery, should delivery be demanded by the buyers of gold in New York. In fact, most of the contracts traded at the COMEX are settled in dollars so to date this has not been an issue – at least so far. However, China will become a major gold trading center in the next few years, and they are not intimidated by Washington’s “regulators” or the IRS. Should China’s gold & silver exchange allow metal prices to rise higher than the suppressed prices seen daily on the COMEX, in recognition of gold and silver’s true supply and demand fundamentals, it would become profitable for wholesale purchasers of gold and silver to buy and take delivery of their metal in New York, and fly tons of gold & silver to China for sale at higher prices. This is called arbitrage, and arbitrage is a widely used and a totally legal market mechanism that fixes prices on identical items traded in different markets. An arbitrage trade for gold and silver, if allowed by Washington, could close the COMEX gold and silver market as the COMEX’s metals will at some point be transferred to China at a profit. But laying too heavy a hand on the free movement of gold flowing out of the COMEX vaults would damage the trust and confidence currently held by COMEX’s large traders. There is nothing stopping these large traders of gold and silver from exporting their operations from New York to Shanghai, except the fear of incurring the wrath of Washington, and China’s current policies of restricting the importation of private gold, and its prohibition of exporting gold. China’s policies on cross border traffic of gold and silver would have to change before it affects the COMEX, but things change all the time. This is speculation on my part, not a prediction. But what isn’t speculation is that US Government’s economic “policy” is controlled by left-leaning social and political scientists who have contempt for free-market prices. These government bureaucrats neither buy nor sell what they regulate, but they believe they have god like powers to intervene into markets via monetary inflation or regulatory fiat for their ill-advised political purposes. But as “stupid is what stupid does”, Washington will continue to hide the inflationary consequences of its imprudent quantitative easings by attempting to depress the market price of gold and silver via the COMEX’s paper gold and silver market. Ultimately they will fail, and free-market forces will cause gold and silver prices to rise to their actual free market valuation at the COMEX, or cause the precious metal trade to move to greener pastures than the United States at some time in the unknowable future. The thing to note about the chart above is how the supply of gold in New York increased during our two bull markets, and then decreased during the bear market. Like bikinis or snow shoes for sale in summer and winter, the market increases inventory for an item in demand, and liquidates items from inventory when demand declines. 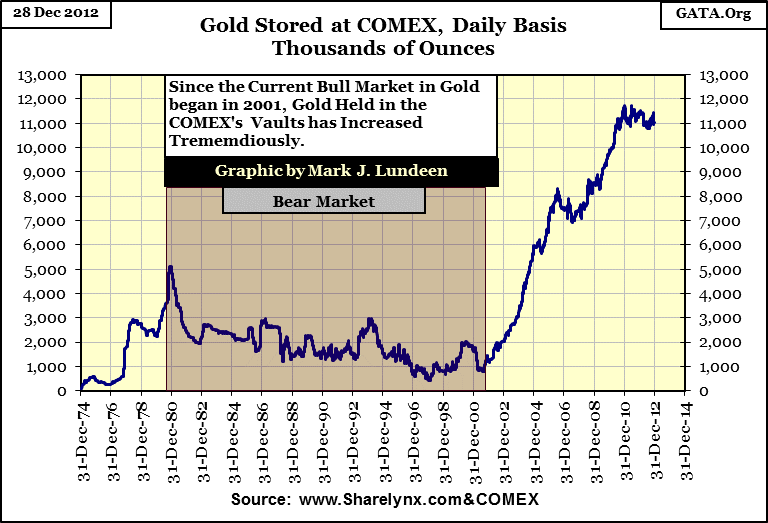 This is exactly what we are seeing in the chart above, and the demand for gold since 2001 (increase in COMEX gold inventory) is amazing. But note that not all gold held at the COMEX is available for purchase, as the COMEX offers a for-fee service, to store gold for individuals. But I wouldn’t trust them. This pattern of increasing inventory during a bull market and declining inventory during a bear market has not been the case at all for the silver stored at the COMEX, as seen below. During the silver bull market of the 1970s, unlike bikinis during a hot summer, and gold above, the supply of silver went down as demand increased. I know the Hunt brothers were purchasing all the silver they could lay their hands on the 1970s, but why did they choose silver and not gold? Because they got it right. Hunt brothers or not, the supply of silver as far back as the 1960s was in shortage to its demand, and deserved to rise in price to balance available supply to demand. President Johnson on signing his legislation for the removal of silver from US coinage said as much. But unsaid in this speech was the US establishment’s determination to prevent the price of silver (“a scarce material” as per Johnson) from rising to its true market clearing price since 1965; five decades ago. This must also be seen in the context of the US Treasury’s demonetizing gold in August 1971. Having the price of gold and silver rising to unbelievable prices from 1971 to 1980, so soon after Washington demonetized their precious metals stored at the US Treasury was a major embarrassment, as the paper dollar and base metal coins were proving not to be as solid a currency as gold and silver coins, demonetized or not, continued to be. Considering President Johnsons quote above, it’s unlikely the shortage of available silver during the 1970s bull market was due to suppliers of silver withholding supply from a hot market. This reduction in the inventory of silver was due to the inability of the mining industry to supply sufficient silver to the market as demand increased. Now look at the huge surge in COMEX silver after silver peaked in January 1980. COMEX silver inventories increased 225% from 1980 to 1992, peaking at 283 million ounces in March 1992 as the price of silver collapsed 90% from 1980! What is that all about? The collapse in investment demand returned many tons of silver back to the COMEX – but not for long as industrial demand for silver continued to increase. In the silver market, the US government (for decades) has been successful in severing any connection the price of silver has had to its supply and demand fundamentals. 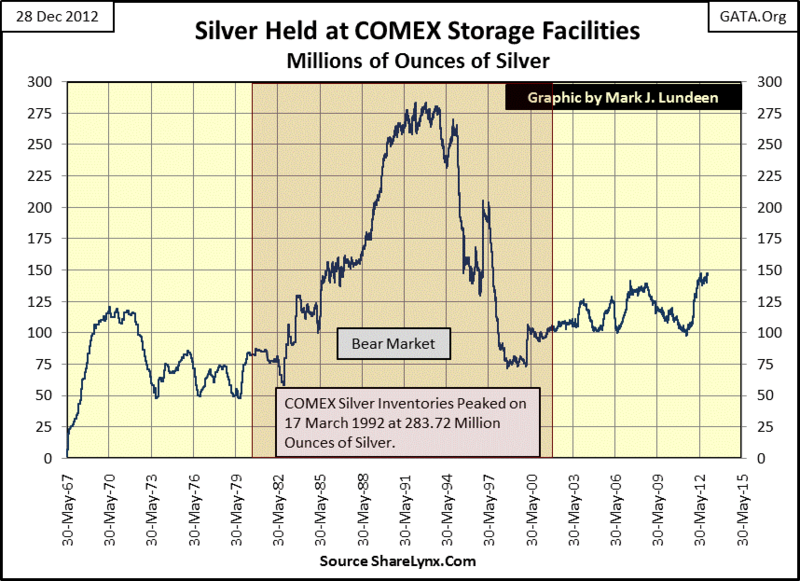 In 1994, during a huge bear market, COMEX silver inventories began draining, but to where? It couldn’t be to satisfy investment demand as silver’s bear market still had seven years to go. Most likely this cheap silver was a gift from Uncle Sam to industrial users of silver. I say this as the US Government during this time was busy selling their huge inventory of silver from its strategic stockpiles. The San Francisco Mint placed an ad in either the SF Chronicle or Examiner’s help wanted pages (I’ve forgotten which) for moving silver in 1994. If I remember correctly, the SF mint was specific enough in their ad to understand they needed workers to move silver to trucks. In 2002 the US Government announced their five billion ounce inventory of silver was finally exhausted; dumping much of it during a bear market ensured the worst price possible for the US Treasury. Congress could have instead passed this silver directly to the taxpayers, who it actually belonged to, and force the industrial silver consumers purchase it from us at market prices. Doing so would have been a nice windfall profit for the poor, as well as the middle class, but that isn’t what Washington is all about. We taxpayers may pay taxes, but corporate political donators also give large sums of money directly, but discreetly, to members of congress and to occupants of the White House. And that made all the difference in Washington’s decision on how best to dump billions-of-ounces of silver into the global silver market from 1965 to 2002. I remind my readers that the inventories of gold and silver charted in this article are those reported daily by the COMEX, and are not global inventories. But then those are the only inventories the COMEX has to operate with. If demand for actual delivery of metal overwhelms the COMEX’s ability to deliver metal some day in the future, it will default. The government’s “regulators” may declare a force majeure (an “unforeseeable” act of nature), and allow the big banks to settle their silver contracts in US dollars. But what will the banks’ counter-parties call this? A rip-off they won’t soon forget! This would be especially so should the price of silver explode in the spot market on news of the default. I expect the CFTC will declare silver’s dollar settlement price for the COMEXs defaulted contracts at the last COMEX silver price at the announcement of the force majeure. Well, we all do what we can to save the big banks when they get into trouble, so don’t feel sorry for the COMEX longs should they get paid $50 to $100 dollars an ounce under the spot price of silver after a default. But I guarantee you that the longs will feel sorry for themselves and become bitter-former traders who will never trade metal, and possibility anything else in the US ever again. So a default in the NY gold or silver markets, both tiny compared to the US stock and bond markets, could signal a pending failure of the entire US financial markets due to lack of interest. I’m not saying that the US debt markets will become a “no bid” market. The Federal Reserve is always there to buy what others refuse. That sounds really bad, but how likely is something like that to happen? Well, if what I’m hearing from Eric Sprott of Sprott Asset Management, and Bill Haynes of CMI Gold and Silver, current precious metals investment demand is buying over 50 ounces of silver for each one ounce of gold purchased. In other words, when retail or large private investors enter the precious metals market, they prudently use 50% of their money to buy gold, and 50% to buy silver. And that is a real problem for the COMEX, and other precious metals wholesale markets, because for political necessity, Washington’s “Wizards of Smart” have seriously underpriced silver to the extent where 55 ounces of silver currently costs as much as 1 ounce of gold. Why is that a problem? Because the COMEX only has 13.31 ounces of silver available for each ounce of gold in storage. In other words, demand for silver is consuming global silver inventory at a rate four times faster than gold demand is consuming gold inventories. This assumes that global inventories of silver and gold are similar to the COMEX, and this may not be true. They may have more, but most likely they have fewer ounces of silver than gold available for sale than the COMEX. Examine the last two charts; since 2001 the Gold Silver Price Ratio (two charts up) has been over 50 ounces of silver to 1 ounce of gold. Assuming that investment demand for precious metals since 2001 has been for gold and silver in equal dollar amounts for metal purchased, a reasonable assumption, silver inventories will soon become critical. A supply shock in the silver markets could be mitigated if Washington allowed the price of silver to rise, bringing the Silver to Gold* Price Ratio * (currently at plus 55) decline to the COMEX’s Silver to Gold * Inventory Ratio * of 13.3. The price of silver would have to increase by a factor of four ($121.2), or the price of gold would have to decline by 75% ($412) to make this happen. Due to current central bank demand for gold, a 75% decline in the price of gold is just not in the cards. So, I anticipate someday soon see will see silver trading substantially above three digits. 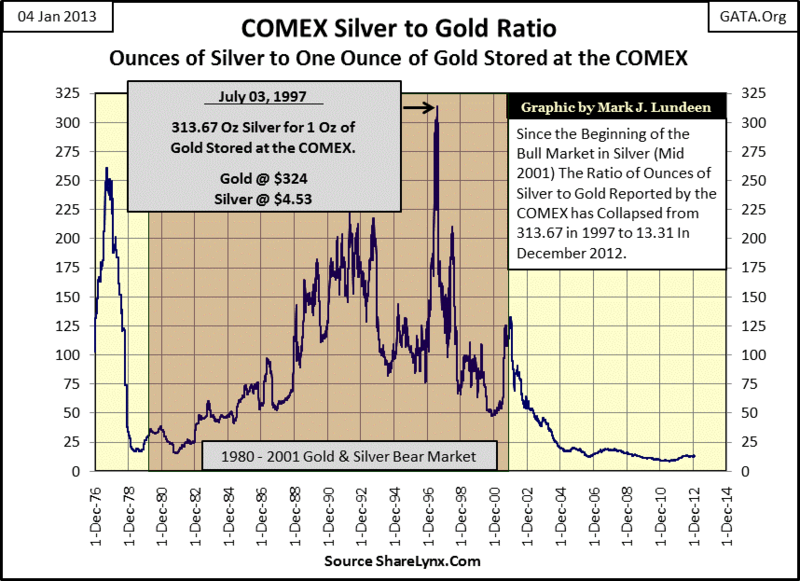 However, matching the Silver to Gold PRICE ratio, to the COMEX’s Silver to Gold INVENTORY ratio cannot be the ultimate solution to the “policymakers’” problem of rising gold and silver prices. How can it be when the real problem is their “policy” of inflating their national currencies to worthlessness for short-term political gains, as the United States has been doing for many decades! Look at the chart above. One either understands that rising gold and silver prices are baked into the cake for years to come, or they’re idiots. I don’t mean to offend anyone who disagrees with me, but this chart makes clear that Washington is killing the dollar, and it’s actually sad how few people understand this, and the implication this data’s has for the future price of gold and silver. Had the US Government maintained their Currency in Circulation at its 1925 level of $3.96 billion paper dollars in circulation, the amount that $3.96 billion of gold reserves held by the US Treasury would allow in an honest gold standard; an ounce of gold today would still be priced at $20.67. If gold today is now over $1650, it’s only because Washington has inflicted the banking system’s management with inflationary-buffoons like Alan Greenspan and Doctor Bernanke. So, to those of us who understand the market’s malaise for what it really is; central banks doing what their political masters demand of them, we’ll pass on Jim Cramer’s bank stocks, and hold on to our gold and silver no matter what Dennis Gartman would have us do. 1. Firstly, it is a basic human right to choose to save, without our savings being debased by the tax of monetary inflation. Those that are worst affected by this inflation tax are not the rich, they benefit; but the poor and the barely well-off, which is why monetary inflation undermines society and why the right to sound money should be respected. If government gives itself a monopoly over money, it has a duty to protect the property rights vested in it. 2. Secondly, it is a basic right for us to own our own money rather than have it owned by the banks. For them to take our money and expand credit on the back of it debases it. It is an abuse of an individual’s property rights and a banking licence is a government licence to do so. If anyone else was to do this, they would be guilty of fraud. Banks should be custodians of our money, and it should not appear in their balance sheets as their property. As we know most economists are very bright people. BUT there are socialistic, Keynesian economists who advocate that the ECB should recapitalize the failing banks and basically do what has been and continues to be done in the US to no good effect. With influential economists, advocating more QE and the attitude of the controlled media we are doomed to the greatest worldwide depression seen in history. This is what the elite want and what they are determined to have and will have unless we the great unwashed wake up before it is too late. With the depression will come social unrest and upheaval? There will be military on the streets (already planned for by the North American mutual aid pact ) and martial law declared. (effectively put in place by Obama 24th Dec 2011) You will not be able to move without papers and ID. You will possibly lose your right to property. The problem is the unpayable debt; Personal, institutional, and sovereign. Why do we have these debts? Because every single bank note in existence, every credit entry on a computer, every chit invented is a debt to someone. The banking system, starting with the incorporation of the Bank of England in 1694, has issued into existance larger and larger amounts of currency. The US Federal Reserve was modeled after the Bank of England. Since the Bretton Woods agreement in 1944 the US dollar has been the de facto reserve currency and it was supposedly backed by the 20,000 tonnes of gold held in the US. 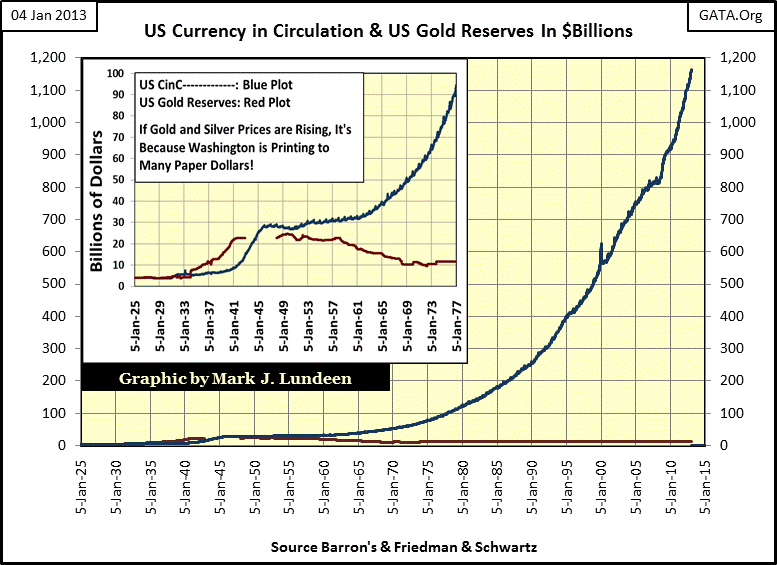 As too much currency was printed (fractional reserve system) the demand to convert to gold depleted the US gold reserves to its alleged amount of 8200 tonnes today. The problem was twofold. The price of gold was fixed in US dollar terms and the dollar not allowed to float in price against the fixed value of gold. And the US went to a fractional reserve system that allowed many units of currency to be printed against only a single unit of gold. As all other countries fixed their currency values to the US dollar they too were forced to print currency in excess and so was born the monster that is consuming us today. Nixon reneged on the promise to pay gold in exchange for a note (redeemable became todays note that is irredeemable) in 1971 and since then it has been a free for all of debt issued currency. Can you spell inflation yet? All currencies buy less each year because their value is reduced by every excess extra bill printed or computerized into existence. That is the reason we all spend our money before we receive it. We all borrow today against tomorrow’s earnings; All of us, even those with no personal debt. We allow our governments to run deficit financing. Most western nations have a sovereign debt per capita of around 35,000 per person. That is just what is on the books. When the off budget amounts such as pension payments, social benefits, wars, etc. are added, per capita debt goes to over 100,000 per person. The number of people who can service that debt to pay the interest or pay back the principal is less than a half of the working population. That puts the debt in the range of 400,000 to 500,000 or more per person able to handle extra debt. You can now see that the debt is so large as to be unpayable. Now ask yourself if borrowing more money will solve the problem and help pay off the debt you already have? Of course it will not. Another credit card puts off the day of reckoning a little further until you are totally cash strapped. Welcome to the US, UK, Ireland, Italy, Portugal, Spain, Belgium and Canada. This list is not exclusive. Soon will be added France and Germany. Each country has bought bonds (debt owed) from these nations. All owe to each other. The whole is as strong as the weakest link. Do you see the contagion. This is just the European banks. When one considers that much debt is owed by Europeans to US banks and vice versa we have a cross Atlantic contagion. This is why most economists are so dangerous because they suggest there is a solution. It pacifies the locals. The government will look after it all. I’ve got news for you. The government won’t because it can’t. The more it tries the worse it gets. YOU have to take care of yourself. No matter what, there will be a gigantic economic implosion of debt defaults. The sooner done the better off we will be. The longer it is put off the worse it will get. Paper money backed by nothing is worth nothing. All money reverts to its intrinsic value. In the case of paper a few cents. In the case of a computer entry to your account, it will be a big fat Zero. Mankind through the ages has bartered and traded. Great fortunes have been made by trading. To facilitate trade a medium of exchange was decided upon. Mostly it was a commodity called gold and more often silver. Why? because they have the attributes wanted by the users. Portability, durability, fungibility (readily recognized and accepted by many people in many places, one unit exchangeable for any other unit), Easily divisible, not easily replicated, and in limited supply (relatively rare or requiring much effort and energy to produce) and finally acting as a store of value because of the way it is a medium of exchange and it is a commodity. The only time a bank note (currency) is retaining its value over time is if it is redeemable for gold or silver one for one. A good banknote is a receipt from the bank for the exact amount of money you have in storage. Of course you can keep your gold and silver at home and no receipt is necessary. We must go back to a monetary system that uses and recognizes these age old truths. We must return to gold and silver coin as money. It must be recognized by weight alone and of guaranteed quality. There must be no designated numerical value on the coins. Ultimately the monetary value of the coins will be set in the market place. You will buy and sell using so many ounces of gold or silver. This, also, can be done electronically, as in using a debit card. A principal way to protect yourself from the collapse of the value of paper money is to obtain as many ounces of gold and silver as you can while it is still available and your fiat money has not depreciated to the reduced value where you cannot afford to get any at all. To expunge the world’s debts it is likely the value of gold priced in paper money will be multiples of today’s values. It could be 5, 10, or 100 times. Nobody knows as it depends how fast your central bank prints or produces more fiat currency. It could be 20,000, 50,000 or 100,000 per ounce of gold. 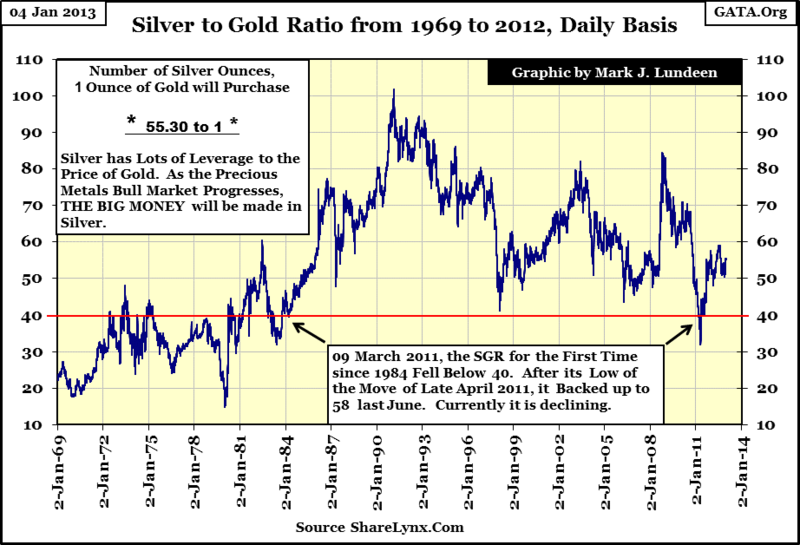 And if silver reverts to its historical ratio to gold it could go to 5000 – 10000 per ounce. You will note I did not use a denomination sign in front of the numbers as it applies to all currencies. Do not listen to false prophets. Protect yourself. Any individual, corporate body or government agency can form and use their own currency and use it for trade if they wish. Many local communities have created script to use as money and thousands of corporations have printed coupons that can be traded for goods or services. At this time all national currencies are fiat (mandated) and backed by nothing but the solvency of the state to back their value. Prior to the abandonment of the gold standard in 1971 it was possible to demand gold or silver in exchange for the note. They were inscribed with “Pay bearer on demand” an amount of silver or gold. Today, all that is on the bank note is, “this is legal tender”, and in some cases there is nothing except a denomination to be used for trade. On a UK 5 pound note the inscription says I promise to pay the bearer on demand the sum of 5 pounds. So it is just a promise to give the bearer another 5 pound note. The Euro just has figures for the amount prescribed. All nations are in competition for trade advantages and one way is to devalue the currency against all the other currencies. But all countries are up to the same trick and so it results in rounds of competitive devaluations with all nations printing more notes to debase their currencies. This results in worldwide inflation which penalizes all savings accounts including pensions, educational funds and any other money pool. What is needed is a currency that protects the holder from inflation and maintains its purchasing power. It will be a currency that is no one’s liability and cannot be debased. Historically people through the ages have chosen gold and silver. It is recognized that the current monetary system is in place and it is too disruptive to remove and replace with another overnight unless there is a total collapse and the disruption already evident. It is suggested to place a silver coin currency in parallel with the existing fiat paper currency and let the people decide which they prefer to use. It is proposed to introduce silver coins denominated by weight only. There will be no stated dollar value on the coin. The basic coin weight will be one troy ounce. (Other coins could be one half ounce, one quarter ounce, one tenth ounce, one 20th ounce and 100th ounce). The coins will be probably be given assigned names by the users, such as Canada’s Loonies and Toonies coins. Names such as a buck, a half, a quarter, a dime, a bit and a cent are already in the public memory. Or new names can be picked by the public. You can choose a name. As the world price of silver fluctuates it is crucial that the monetary value of the coins is always higher than the world price of silver bullion or people will horde the coins and have them melted down to bullion and the currency will go out of circulation. The government will be paid a seigniorage of 10% and a fee to cover the cost of minting the coin say 5% and there should be a buffer of say another 5%. To a total 20%. Consider the one ounce coin. The government will set a monetary value for the coin of not less than 20% higher than the world spot of the equivalent weight of silver. This monetary value can be increased if the spot price rises but never ever reduced if the spot price falls. All the other coins will be assigned a monetary value pro rata. E.G. The spot price of silver at the time of writing is $31/ounce. 31 plus 20%=$37.20. For simplicity the monetary value will be raised to the nearest multiple of 5. In this case it is $40. So the monetary value is announced as $40 and this will be on the government web site and published daily in the press. All other coins are valued pro rata. So this silver coin retains its buying power and increases in value with inflation. Now you can sleep at night knowing your savings are not suffering the ravages of inflation. The country (or issuing authority) accumulates the seigniorage and adds it to the national reserves. At some time Gold coins can be added on a similar basis and the accumulated gold will now begin to back the general currency of the country. At some point the bank notes would again say pay bearer on demand one ounce of silver or gold as the case may be. It is suggested that at some time all people will be given the right of coinage and on application to the mint will expeditiously exchange bullion for coin. There will be times when it is profitable for the average person to exchange bullion for coin. This will be at a time when the spot price has retreated from a high. Having coin as a savings plan also has the advantage of not dropping in buying power whereas bullion is subject to market vagaries. It is felt that people will choose silver coin for savings, over fiat bank notes, and that they will be able to be deposited in bank accounts and exchanged for fiat at any time. Perhaps banks will hold sufficient silver coin that the average person will be able to go to a bank to obtain silver coin. It would be to the advantage of the bank to hold silver coin. The function of electronic banking will not be affected. Convenience will not be compromised. Not only will this be known as Sound Money but when you throw it on the counter the unmistakable tinkle will give the right “Sound”. The increased demand this will give for silver bullion will put upward pressure on the silver price. The ones who adopt this policy first will see the largest benefit as at some point the rest of the world will follow. Several states in the US are considering coinage legislation and in Mexico it is before Congress to consider the monetization of the one ounce silver coin the Libertad. The time is now to implement sound money, silver, for the benefit of all citizens. Some bullion coins are already currency. They do not circulate because the designated trade value is way below the market value and so they are hoarded. Imagine what would happen if the government decided to use silver coin for money and implemented a policy such as this. The one ounce Maple Leaf silver coin will be issued a monetary value according to its silver content. The one ounce silver coin .9999 pure contains one troy ounce of silver and will be issued a monetary value guaranteed to be 20% higher than the world spot price at the Friday close each week. While this monetary value will be allowed to rise according to the world market spot price for a troy ounce of silver it will NEVER be allowed to fall. This adjustment in the price will be done on the Sat night/Sunday AM time slot. The Spot price of silver is in Canadian dollars $33.77. Plus a markup of 20% or $6.75 = $40.52. The $40.52 is then rounded up to the nearest multiple of 5 which is $45.00. All one pure ounce Maple Leaf coins will now circulate for monetary purposes at the designated monetary value regardless of the printed amount on the coin (currently $5.00). Should the spot price of silver rise at close of busines on a Friday to a price higher than 80% of the monetary value, such monetary value will be adjusted that weekend by a multiple of 5 until again the monetary value exceeds the spot by 20%. Say the spot price rises to $36.00. Plus it by 20% = $43.20. Raise it to the nearest multiple of 5 = $45, so there is no change in the monetary value as suggested in the calculation above. If the spot price increases to 38.75 we calculate the new monetary value as follows. Plus the spot price by 20% = $46.50. Rounded up to the nearest multiple of 5 = $50.00 as monetary value, for an increase of $5. If there is a slump in the price of silver and it drops in the spot price to $30.00. Plus by 20% = $36.00. That is a lower price than the high of $50.00 so the monetary value is unchanged and remains at $50.00. As these reserves accumulate it adds strength to the value of all Canadian currency and the Canadian economy. At a suitable time treasury notes or certificates can be issued as representing ounces of silver only with no printed value. They would also circulate with a monetary value similar to the coin. i.e. A Ten ounce note would have a monetary value of $500.00. This note could be backed by silver coins but it MUST remain 100% backed by silver. The issuance of notes would not commence until the public were accustomed to pricing goods in ounces of silver and there was a public demand for the issuance of such notes. The Canadian Government would be cautious in this policy in order not to replace one set of irredeemable notes (current fiat currency notes) with another set of irredeemable notes. It is worth repeating that ANY NOTES ISSUED BY TREASURY MUST BE 100% BACKED BY PHYSICAL SILVER AND THAT FRACTIONAL RESERVE BANKING OF ANY KIND RELATING TO SILVER OR THE NOTES WOULD BE OUTLAWED. For Canadian citizens the preferred method of saving would be in legal tender coins which could only go up in monetary value and not down. Mining companies doing business in Canada and or mining silver in Canada would happily sell their silver to the Canadian Mint at world spot prices, which is what they would get elsewhere, and take back silver legal tender coin in payment. To the argument, “What on earth would a miner do with 1 million ounces of silver coins?” The answer is: “The miner would deposit them in his bank for the monetary value of $50,000,000 Canadian Dollars. He could then write checks on his balance. The Bank would be able to pay out silver ounces @ $50 each, to depositors withdrawing funds. There will be enormous demand for these coins, which cannot fall in Canadian dollar value, but only appreciate. The miners would be saving and holding cash in silver which could not fall in monetary value which effectively hedges their savings. The country pays the mine in the same commodity it just bought less a seigniorage charge. This will cost the government nothing and so can be done immediately in any volume desired. The country accumulates silver seigniorage to its reserves. The miners are now able to pay their staff, if the staff desire, with Canadian currency of legal tender coin. The Mint, on implementation of these policies immediately ceases production of one ounce Silver Maple Leaf coins with a numerical value stamped thereon. Instead only the guaranteed weight and fineness would be stated. Banks would be able to store, in vaults, any amount of silver Maple Leaf coin on behalf of customers. Such “deposits” would be custody accounts secured by the bank but would not be the property of the bank. (Currently, cash deposits, that pay interest, become the property of the bank and the bank is able to lend that money with no permission from the depositor.) It is foreseen that the bank would/could offer services to the depositor for which they could charge. An electronic bank account could allow a depositor to use the “Money” in the bank to pay for goods and services by card as is currently done. As the trade flows back and forth an accounting is kept and the settlement made in specie according to the records. The depositor could claim back from the vault up to as much coin as his account now says he owns. It is suggested that the Government of Canada form its own commercial bank to facilitate the distribution of Maple Leaf coins in the widest dissemination. It is further suggested that the Canadian Postal Service, Canada Post, be utilized for this purpose. It is already in place in every town and has a courier service component operating. At a time when the world spot price of silver drops any appreciable amount it is also the time that the seigniorage to the government is greatly increased and so it is an opportunity for the government to buy bullion to issue in to coin at the much higher monetary value or at a later date at a still higher value. However, at no time can anyone demand the mint buy bullion from them. The mint will be instructed to coin silver money to meet demand but it will be the prerogative of the National Bank to decide when and where the bullion is obtained and how much is paid. The Royal Canadian mint will provide the same guaranty of weight and quality of the coins as at present .There will be no taxes on monetary coin. It is recognized that a .9999 pure silver coin is not the most durable as its softness causes wear and tear. It is further recognized that sterling coin of 92.5% pure with the balance alloyed with copper provides a much harder more durable coin. It is proposed that at a future time consideration be given to production of sterling silver coins but still containing the full one ounce of silver as has the Maple Leaf. It is proposed to monetize the one ounce Maple Leaf as it is already widely distributed and recognized, for guaranteed purity and weight, worldwide. As we expect the silver coin to be used initially as a vehicle of savings it is not expected that the one ounce silver coin will go into immediate circulation to any large degree. At some point the coins will start to be useful for circulation and trade and that would be the time to provide sterling coins as demanded by the people. “The restoration of the silver currency of the United States of America (Canada) by the very simple procedure outlined here can provide the life-saving alternative. There is, at present, no practical proposal for a viable action in the field of money. Perhaps there can be no other practical proposal? Perhaps a return to silver money is the only path out of the present crisis of civilization? Long live a free sovereign Canada.